One of the main causes of retaining wall damage is excessive water buildup. Whether it is a simple retaining wall of wood, stone, or brick or a large complex retaining wall of concrete, water damage is an ever-present danger to the walls integrity. 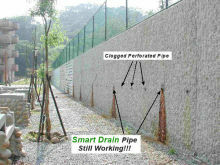 Water pressure can crack and deform retaining walls leading to costly repairs and in some cases replacement. 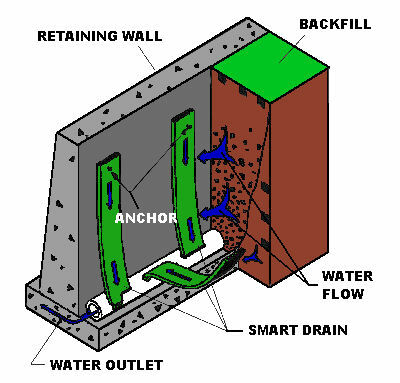 SMART DRAIN� , installed on the back end of a retaining wall, can minimize the damage due to water and extend the life and integrity of any retaining wall. 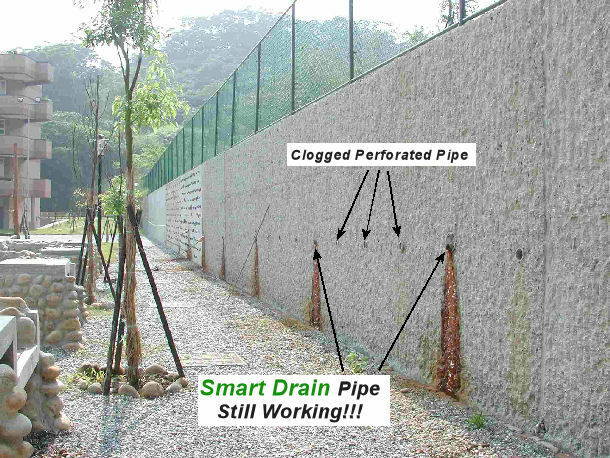 Since SMART DRAIN� doesn't clog, it will last the life of the retaining wall. Since it is highly efficient, water is whisked away from the surface of the wall before it can cause major damage or build up destabilizing pressure. Seepage is virtually eliminated as a problem. No other drainage system delivers so much while at such a low cost. Just about everyone has seen the PVC pipes coming out of highway bridge retaining walls that no longer seem to drain anything. That�s because they are usually clogged with silt and no longer work. It seems inevitable that sooner or later the drainage system on these expensive retaining walls will fail within a few years while the wall is built to last for decades. Now there is a drainage system that will last as long as the bridge. SMART DRAIN� is so long lasting and efficient, drainage maintenance and water damage will be virtually eliminated. All this for a system that is easily and economically installed! 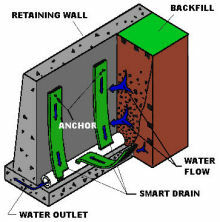 If you are working on a retaining wall project, contact us to learn SMART DRAIN� can enhance the life of your project. We will show you proven designs that have been used successfully in other retaining walls.